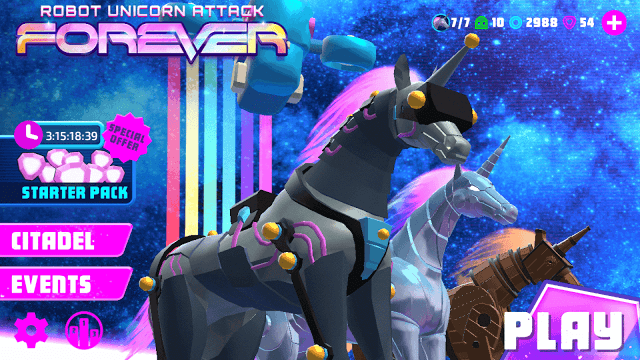 Adult Swim Games’ Robot Unicorn Attack 3: Forever is an endless runner that lets you build a team, control unicorns by tapping the left and right side of the screen and smash obstacles that come in between your runners and their freedom. Rare and epic unicorns must be put to good use. They offer exciting in-game bonuses, such as 30 percent bonus XP (Oak XE), extra 20 percent to your total score (Vee-R X) or extra 20 percent Soul Crystals (Vector). You can get them from the Tear Stone and Stone Crystal Forge. I received two rare unicorns from the tear stone forge. Once you have a sizeable robot army, try to level up your rare/epic runners by combining them with common robots. Next, tap the “Team” button and replace your current team with your upgraded robots. Your team should consist of rare/epic runners as they will let you score more points, get more XP, soul crystals and tear stones in every level. Those huge stars should be smashed by tapping the right side of the screen. You will get team bonus EXP when you smash into stars. Don’t jump over them. Try to break as many as you can. The more EXP you earn, the faster your runners will level up. Many times double taps may not lead to a successful jump from one platform to another. This usually happens when the distance between two platforms is too long. Your runner will either fail to land safely or smash its head against the cliff. In such situations, the dash button comes to your rescue as it gives a much-needed boost to your jumps. When you are at the edge of the cliff, quickly tap the left side of the screen twice. When your robot is in mid-air after the second jump, tap the dash button to make it sprint to the next platform safely. Time your double jumps before tapping the dash button. When jumping between two cliffs, go for the second jump when the robot goes down a bit, but make sure it does not go too low else it will crash against the wall of a cliff. Increase your team’s power to level up your citadel. When runners level up, their power increases. A unicorn earns EXP and once its EXP bar is full, it levels up and his power increases. You will have to keep running to raise your team’s power and reach the citadel’s power target to upgrade it. Once you have added rare/epic robot to your team, use them to cover longer distances and smash stars to gain bonus team XP. The longer a unicorn runs, the more EXP it earns. Don’t forget to smash golden/silver stars to get extra EXP. Try to stick to your current team if you want to increase its overall power (team power = combined power of all 3 unicorns). This will help you reach your citadel’s power target pretty quickly. You will get cool rewards after leveling up your citadel. Rewards may include a new stable slot, increased vault size and a free chest. If you are not playing Robot Unicorn Attack 3: Forever, then send all robots on raids to get some sweet loot. It may take anywhere from 8-22 hours to complete a raid. On completion, you will get lots of tear stones or stone crystals depending on the mission. A mission requires a unicorn based on its rarity. Epic missions will need players to send epic unicorns whereas common unicorns can be sent on common raids. Mission rarity depends on the time taken to complete a raid. An Epic raid will take more time to complete than a mission that requires a player to send a common unicorn. Higher the rarity, greater the rewards. Chances of getting soul crystals are more on rare or epic raids than in common raids. 1. Collect tear stones in a level and then double the amount collected by watching a 30-sec video. This offer appears on the game over screen. Tap the “x2” button to double your rewards before tapping the retry button. 2. Enter special events to win rewards. You can get lots of stone crystals and tear stones by playing limited-time events. Each event has a particular objective which needs to be completed to earn rewards. You will have to spend stones to enter an event. 3. Spin the Wheel of Joy to get treasure chests. But you will have to watch a 30-second video to spin it. 4. While running, look for the big solitary tear stone and jump to collect it. The big stone contains 5 more stones. 5. Level up the Citadel to increase the tear stone generation rate. The citadel generates tear stones per hour while you are away. You can come back any time to collect them. You will need special tokens to purchase Unibots. You will get them for the first time when your citadel reaches level 5. You may also get these tokens from the wheel the joy. Use these tokens to recruit a bot at the Unibot Forge. Now go to Stable > Team and then tap the “Bot” button to assign a unibot to a runner. While assigning Unibots can really augment your weak runner’s abilities, it might also reduce certain abilities. The Drone Bot provides 30 percent bonus stones to a level, but it also reduces 30 percent from your total score. So select a unibot wisely. Your first tip is not that bad for beginners that don’t have legendary or radiant bots/noobs but the bot wheels XE gives you practically all of that. I have a Galaxy S8 and have never been able to use Event since I started playing. I’m signed in, and connected to Wifi. I can see the Rankings and my stats, have made sure the app has all “permissions” required allowed…so…no idea. I just know I’m missing out on potential goodies. ???? Try uninstalling and then reinstalling the game or clear cache/data via app settings. Thought about doing that but concerned that I will I lose my progress? Newer to RUA3. Every time I try to “Enter An Event” it tells me it to check internet connection, but I am already connected. That’s strange. I just checked and everything’s fine on my phone. I have a 4G connection. When I tap “Events” the screen displays the “Monochromion Massacre” event. When I enter this event, the screen shows “downloading event details” and then displays event milestones. To enter this event I spent 50 tear stones.